Stonedge Stud. Quality Welsh Mountain Ponies. Welsh mountain ponies bred for type, temperament and movement with the ability and conformation to perform and excel in all disciplines. 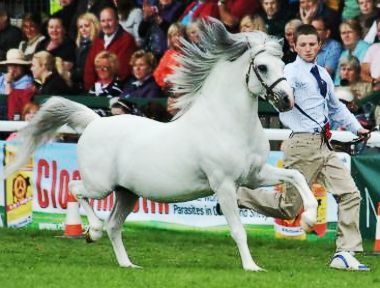 A WELSH Mountain pony hand-reared after his mum rejected him has won the prestigious Royal Welsh Show. 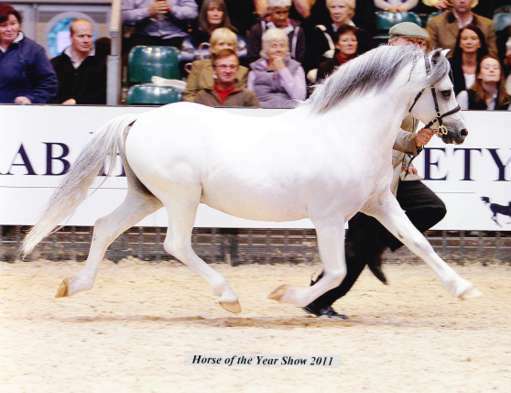 And the adored stallion Stonedge Sam has also qualified for the Horse of the Year Show (HOYS), the Olympics of the showing world. Owner Sally Athey said: �We still feel like we are dreaming. 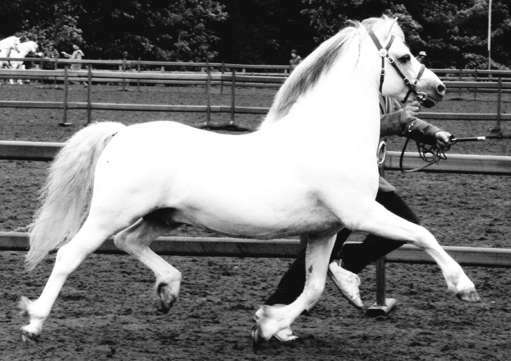 She and her husband Robin bred Sam from a pony they bought as a Christmas present for their daughter Lucia. But when Socks refused to feed her firstborn, the family took over the role of mum to the little colt foal. �It wasn�t easy when we were feeding him every two hours. We were shattered, but he�s rewarded us a million times over. �He�s home produced, home-bred � and home fed! He also likes chocolate digestives and neighs when he hears Mrs Athey returning home from working away each week for a recycling company. �He�s really a superstar,� said Mrs Athey. The excitement at the show in Builth Wells grew over the week. Last Tuesday, the 10-year-old Sam won the senior stallion class. 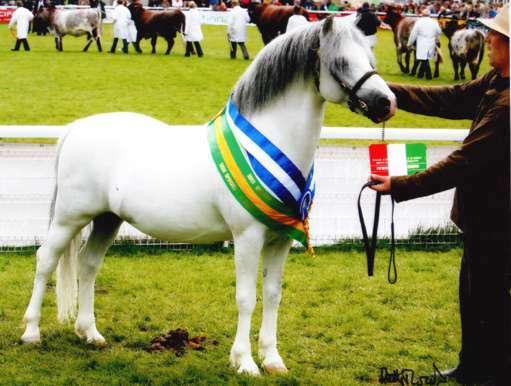 On the Wednesday he was judged the male champion Welsh Mountain pony, winning a gold medal. 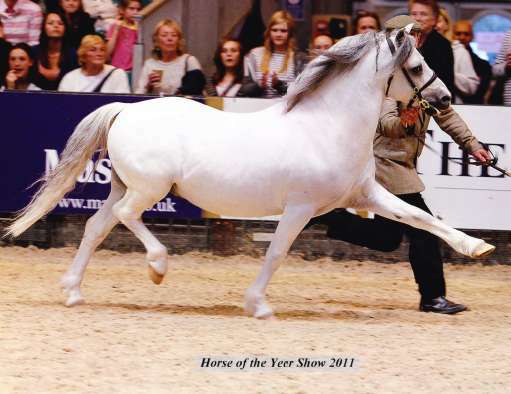 And on the Thursday he beat all the other Welsh pony sections to become champion of all the Welsh pony breeds. 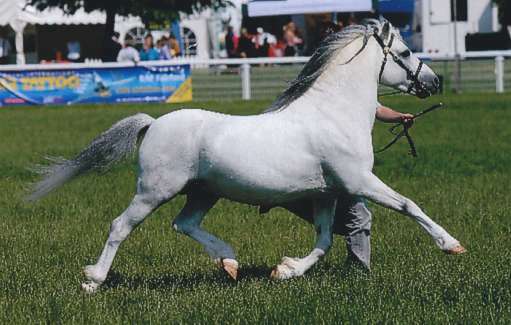 Then he faced other breeds and classes to gain the Cuddy Supreme championship of all the in-hand section, which qualifies him for the HOYS. �We go to HOYS every year, we�ve already got our tickets for this year, but we�ll be giving them to my sister,� said Mrs Athey, now that the team will be going as exhibitors this time rather than spectators. The couple have been breeding Welsh Mountain ponies for the last 12 years since they moved to Stonedge Farm, near Bonchester Bridge. 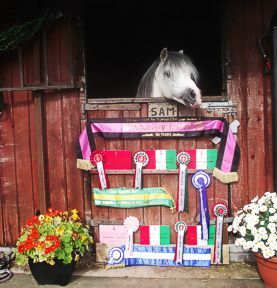 Sam�s mum Socks came about when Lucia was moving up to her second pony. The family went to see some ponies near Glasgow, when Socks left the group to come forward to them. �She chose us, we didn�t choose her. She followed Lucia around the field, she wouldn�t leave her alone,� said Mrs Athey. And whenever her parents asked her what she wanted for Christmas, Lucia just said �Socks�. Later, the pair put little Socks, who is about 11.2hh (46in high) in foal. �Sam was a big foal and she struggled with him. He was her first foal. 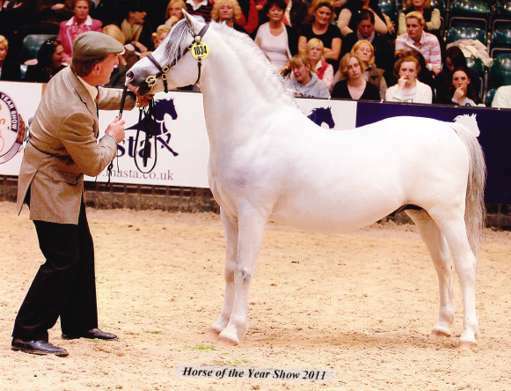 But happily Socks went on to successfully mother other foals and, indeed, Sam�s siblings are also prizewinners, with his sister Stonedge Ser-y-Bore winning the Border Union Show championship in Kelso last year and also taking reserve at last year�s Highland Show. Unusually for the fiercely competitive showing world, Sam is also �produced� � geared up and titivated for the show ring � at home. And Mrs Athey paid tribute to groom Nicole Armstrong. She said: �We couldn�t have done it without Nicole. She helps us produce him. When she came up to us in March she asked us what we would like to do. �We said we�d love to win a gold medal at the Royal Welsh � the Cuddy was a dream � and to get the two in the same week is wonderful. Sam will be taking a year out of showing in 2012 to concentrate on his driving. Stonedge Farm, Bonchester Bridge, Hawick, Roxburghshire, TD9 9SB, UK.